What is B.N.P. with Hydrocortisone Triple Antibiotic Ophthalmic Ointment? B.N.P. 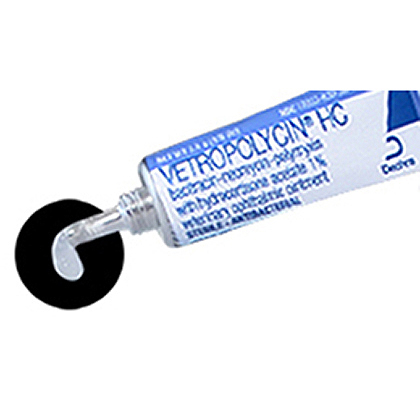 with Hydrocortisone Triple Antibiotic Ophthalmic Ointment is a sterile ointment that is used to topically treat eye infections that are accompanied by inflammation. B.N.P. with Hydrocortisone Triple Antibiotic Ophthalmic Ointment requires a prescription from your veterinarian. 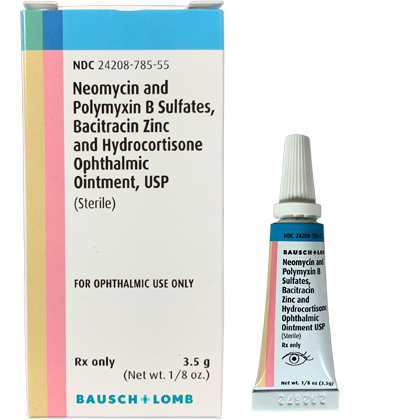 NOTE: B.N.P Triple Antibiotic Ophthalmic Ointment without hydrocortisone is also available. How does B.N.P. with Hydrocortisone Triple Antibiotic Ophthalmic Ointment work? B.N.P. with Hydrocortisone Triple Antibiotic Ophthalmic Ointment contains bacitracin, neomycin, and polymyxin B. These are antibiotics that treat bacterial infections. It also contains hydrocortisone, a corticosteroid that is used to treat swelling associated with bacterial infections of the eye. Before using B.N.P. with Hydrocortisone Triple Antibiotic Ophthalmic Ointment, tell your veterinarian if your pet is using other eye ointments or eye medications. If your pet has swelling of the face or itching, or appears to have difficulty breathing, contact your veterinarian immediately. Do not touch the tube opening to any surface including eyes or hands, because the tube opening is sterile. This product may cause blurred vision. What is the most important thing I should know about B.N.P. with Hydrocortisone Triple Antibiotic Ophthalmic Ointment? Bacitracin, Neomycin and Polymyxin B are antibiotics used to treat bacterial infections. Hydrocortisone is a corticosteroid, which is used to treat the swelling associated with bacterial infections. This ointment is used to treat bacterial infections of the eye, and may also be used for purposes other than those listed. Each gram contains Bacitracin Zinc 400 units. Neomycin Sulfate 5 mg (equivalent to 3.5 mg of Neomycin base), Polymyxin B Sulfate 10,000 units, Hydrocortisone Acetate 10 mg (1%), in a base of White Petrolatum and Mineral Oil. This medication is FDA-approved for veterinary use in dogs and cats. It is a prescription medication available as a sterile eye ointment. What should I discuss with my veterinarian before using B.N.P. with Hydrocortisone Triple Antibiotic Ophthalmic Ointment on my pet? Do not use this medication if your pet has a viral or fungal infection of the eye. It is used for bacterial infections only. Tell your veterinarian if your pet is pregnant or lactating. How should B.N.P. with Hydrocortisone Triple Antibiotic Ophthalmic Ointment be used? Use this medication exactly as directed by your veterinarian. Contact your veterinarian if your pet's symptoms begin to get worse or if you do not see any improvement to your pet's condition after a few days. Do not touch the tube opening to any surface, including eyes and hands. The tube opening is sterile. If it becomes contaminated, it could cause an infection in the eye. If you do not understand the directions ask the pharmacist or veterinarian to explain them to you. Wash your hands prior to using the eye ointment. Apply a thin film of the ointment over the cornea three or four times daily. Foreign bodies, crusted exudates and debris should be carefully removed. Insert the tip of the tube beneath the lower lid and express a small quantity of the ointment into the conjunctival sac in dogs and cats. If applying another medication to the same eye, wait 10 minutes before the next application. What are the potential side effects of B.N.P. with Hydrocortisone Triple Antibiotic Ophthalmic Ointment? Itching, burning or inflammation may occur in animals sensitive to the product. Discontinue use in such cases. Serious hypersensitivity (anaphylactic) reactions have been reported in cats within 4 hours of application of antibiotic ophthalmic preparations. Some of these reactions have resulted in death. Clinical and experimental data have demonstrated that corticosteroids administered orally or by injection to animals may induce the first stage of parturition if used during the last trimester of pregnancy and may precipitate premature parturition followed by dystocia, fetal death, retained placenta, and metritis. Additionally, corticosteroids administered to dogs, rabbits, and rodents during pregnancy have resulted in cleft palate in offspring. Corticosteroids administered to dogs during pregnancy have also resulted in other congenital anomalies, including deformed forelegs, phocomelia and anasarca. What happens if I miss applying a dose of B.N.P. with Hydrocortisone Triple Antibiotic Ophthalmic Ointment? What happens if I overdose my pet on B.N.P. with Hydrocortisone Triple Antibiotic Ophthalmic Ointment? An overdose of this medication is unlikely. If an overdose is suspected, wash the eye with water and seek emergency veterinary medical treatment. If the ointment is ingested, have your pet drink plenty of water and contact a veterinary emergency center for advice. What should I avoid while applying B.N.P. with Hydrocortisone Triple Antibiotic Ophthalmic Ointment to my pet? What other drugs will affect B.N.P. with Hydrocortisone Triple Antibiotic Ophthalmic Ointment? Before using this medication, tell your veterinarian if you are giving your pet other eye ointment or eye medications. Drugs other than those listed may also interact with B.N.P. Hydrocortisone Triple Antibiotic Ophthalmic Ointment. Talk to your veterinarian or pharmacist before giving any prescription or over-the-counter medicines. B.N.P. with Hydrocortisone Triple Antibiotic Ophthalmic Ointment, a sterile prescription antibiotic and anti-inflammatory ointment used in dogs and cats, treats bacterial infections of the eye, as well as swelling and inflammation that usually accompany an infection. This sterile ointment is usually applied as a thin film to the inside of the lower eyelid 3 to 4 times daily. If applying another medication to the same eye, wait 10 minutes before the next application. Store at 59-77 F., away from moisture and heat, away from moisture and heat. Keep the tube properly capped. Other Ingredients: White petrolatum and mineral oil base.